Read more about last year’s event! The Old Lyme Arts District joins the international celebration, Make Music Day, on the Summer Solstice! Come out with your family and friends and stroll Lyme Street from the Congregational Church to Nightingale's Acoustic Cafe and stop along the way to listen to a variety of street musicians including acoustic duos, classical guitarists, jazz ensembles, and fiddle groups. As a nod to Old Lyme's cultural heritage, artists are invited to set up easels along the way as well to paint en plain air to the sounds of live music. Several businesses including the award-winning Old Lyme Ice Cream Shoppe will be open during the stroll as well. We thank the locations where you'll find the musicians: First Congregational Church • Lyme Street Studios (Village Shops) • Cooley Gallery • Old Lyme Ice Cream Shoppe • PGN-OL Library • Town Hall • Old Lyme Historical Society • Lymes' Youth Services Bureau • Patricia Spratt for the Home • Nightingale's Acoustic Cafe • and several residential homeowners (locations may be updated on day of event). Sophie Spaner will be part of the Congregational Church's Teen Hoot. 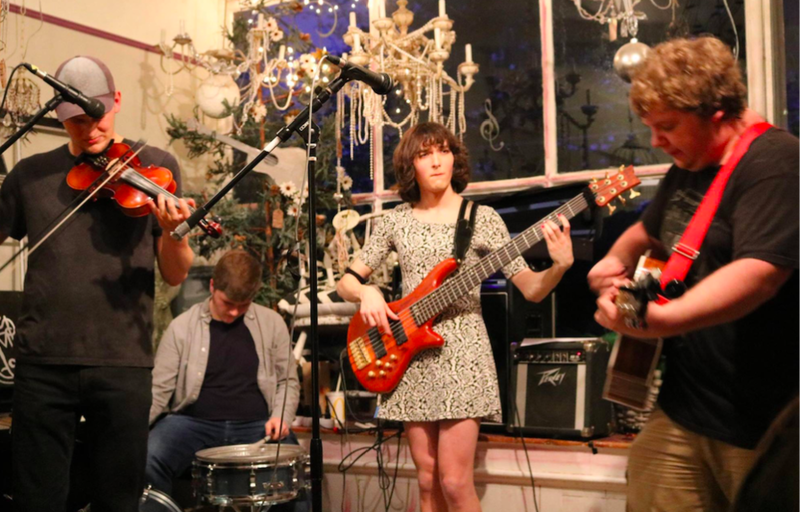 The First Congregational Church of Old Lyme will have a Teen Hoot on their front lawn featuring a number of young artists including the Saxy Saxophones, the ukulele duo Sophie Spaner and Haley, and Riley Fruth, as well as refreshments and activities. Forever Fool, will be Indie Cool during Make Music Old Lyme. Dave Gregoire is part of the duo Whiskey and Aspirin. The Steve Donavan Trio (also known as the Bad Pennies) play at the Old Lyme Inn beginning at 6pm. Round out the evening with the Steve Donavan Trio at the Old Lyme Inn beginning at 6pm. Its sure to be a fun way to enjoy the last of the sun on the longest day of the year! • Rain and humidity don't mix with musical instruments • Musicians reserve the right to cancel due to weather concerns, thank you! Artists wishing to set up en plein air during the music, can email oldlymeartsdistrict@gmail.com for more information. To learn more about the Make Music movement, go to http://www.makemusicday.org. Make Music Old Lyme is in collaboration with the CT Office of the Arts, the Southeastern Connecticut Cultural Coalition, and MusicNow Foundation. Watch this page or our Facebook page for updates and more information - Happy Summer Solstice!